When I was growing up in the suburbs of Massachusetts, there was one home and yard on our street that you could always count on to be messy even while my own family’s home and yard was always clean and orderly. Turns out that this was the home of a divorced mom who launched several successful companies while raising her four sons. We didn’t have too many moms on our street launching companies back then. But these days, we have a lot more moms who create their own jobs and working from home. Some freelance, some telecommute, some invent things, and some start companies. One of the things you find out when you attempt working from home is that everything around you is likely to become a bit messier, while your energy is committed to other priorities. I just want to say that this is how it should be. Because anything else likely means you are working too hard. So that mom’s house was messy. Big whoop. She was (and is) a happy, loving mother of four boys. 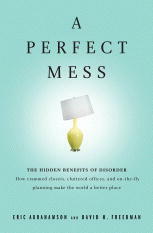 If you could use some help in the loosening up about mess in and around your home or office (or if your spouse could use a crash course), listen to or read A Perfect Mess, The Hidden Benefits of Disorder by Eric Abrahamson and David H. Freedman. If nothing else, you’ll feel a whole lot better by the time you are done. By staying loose in the face of a slumping economy (and refraining from judging others, which also wastes creative energy), you’ll notice that others are affected while your business continues to happily thrive. Hey, I posted some pretty good stuff last year. Whadda ya know about that. Here’s my take in last year’s June Writers on the Rise, Creativity Takes a Rest. And here’s Sage Cohen’s take, Allow Fallow Time, in this year’s June Writer’s on the Rise. People sometimes ask me, where is the “one-pager” I offered in Writer Mama? Well, I found it, in a blog post last June. Really need to move a few of these things to my website…soon. I promise. Look! I found Marc Acito’s recommended summer reads. Nice. Here’s a Recipe for a Happy Writing Career. And here’s a fun list of Random Acts of Summer. My, oh my. I was pretty productive last summer for someone with Strep Throat. Did I ever tell you guys why I get sick a lot less now? I was becoming anemic without realizing it and then catching everything. Now I’m taking iron and I feel a lot better. I can’t remember the last time I got sick, but if I forget, I can always scroll back through my blog and find out! Look for me in the July issue of Health Magazine. I am quoted by the lovely Gretchen Roberts in her article, “Making Time for Me,” saying something very profound (I’m sure). And my picture is there too. At least it’s here. Someone anonymous over at Freelance Writing Jobs likes me, I mean, Writer Mama, enough to put us in a list of “Ten Great Resources for Writers.” Thank you very much! Tacy gave Writer Mama an amazing review, the 22th, over at Amazon.com. I got a TON of fan mail and success e-mails this week (Hello? What is going on???). I think karma is getting faster. Last week I expressed some gratitude and this week it came back in spades in boomerang affect. Love that. In fact, here a little gratitude coming right back at me from Lisa, who added me to her “Thanks Ranks” (I’m telling you, this is spooky). And a couple other friends participated in the gratitude party, Jen over at Highliners and Homecomings and Round the Clock over at Charlotte Parent. My editor contacted me this week to say that there was a spike in sales of Writer Mama last week. I spotted someone over at A Wasted Word is a Wasted Day adding Writer Mama to her recent purchases. Thank you for telling all of your friends! I’m off to enjoy the weekend with the fam’. You gotta love summer. The other day at the local grocery store, the checker told me that the floods in the Midwest had wiped out one third of the store’s summer corn supply, so expect the prices of all things made of and fed corn to go up soon. I turned around and bought some bulk meat, divided it into small servings, poured in some marinade (some call it salad dressing) and froze it. Even someone with a small freezer like mine can do this and stretch a buck. If you have a big freezer, you can really save by hitting the stores now. Kati Neville’s book, Fix, Freeze, Feast: More than 125 Recipes to Prepare in Bulk and By the Serving tells you how. Each recipe includes instructions for dividing, preparing, and storing the raw ingredients, and a second set of simple directions for thawing, cooking, and enjoying the food. These recipes are lighter and fresher than traditional bulk-cooking recipes, with a focus on simple stews and stir-fries, quick grilled or broiled main courses, and popular ethnic meals. Visit Kati’s website for more cooking inspiration. Our annual field trip to the strawberry patch is almost here and I’m looking forward to the buckets of fresh-off-the-vine, sweet berries to use in my strawberry, goat cheese, walnut and spinach salad. The activity will wear my children out so when we return home they’ll play quietly in the playroom and I will stand in the kitchen washing, trimming and assembling our dinner in peace. As I chop, my mind will be filled with whatever essay I’m working on, and I’ll wipe my hands on my pants and hurry to the lap-top and record my ideas. · Visit a strawberry patch with your kids and fill up baskets of berries. Read them Blueberries for Sal, and make strawberry smoothie or muffins. Buy some strawberries from the chain grocery store and have your children do a blind taste test to see which is better. · Shop at your local farmer’s market and sample the goat-cheese smoothie or the organic honey. Talk to the farmers about seasonal foods. · Go to Lowes and buy an all-in-one kid-friendly container that includes seeds for their very own sunflower plant. Buy some impatiens for the box underneath the window at your desk so when you are stuck searching for the right word to describe the way the water feels when you step in for the first time every June, look away from your flat screen and stare into the flowers for inspiration. · Take a cooking class or go wine-tasting with your husband. Come home and write about the taste that lingers in your mouth, use words from the bottle like blackberry, mocha, vanilla and butter. Work on a query for one of the many food magazines such as: Cooking Light, Eating Well or Every Day with Rachel Ray. · Take the kids to the library and check out Salad People by Moosewood Restaurant’s famous chef, Mollie Katzen with recipes for cooking with kids and let your children pick out a recipe to make at home. Or look for any of the food books (Fast Food, Food Play, and How Are You Peeling?) by Saxton Freyman and Joost Elffers who photograph real fruits and vegetable in their stories. Show your children that food is fun: bring the book to the grocery store and attempt to re-create the shape, animal, plane, car and/or boat from one of the pages. You just might just discover something new about food while you’re at it! Back-to-school time and the holidays are coming and the cost of everything is on the rise. If you’re like most moms, you’re probably wondering where all the extra money to cover escalating costs is going to come from. But never fear. Don’t let the economic turndown hurt your plans for professional development. Make adjustments now, hang on to the money you’ve got and avoid overspending in the months ahead. Car-shmar. At least that’s what author Chris Balish has to say in his book How to Live Well Without Owning a Car, Save Money, Breathe Easier, and Get More Mileage Out of Life (Ten Speed Press 2007). You might think at first that this sounds crazy. But go to Balish’s website and watch his interview on CNN and you’ll see that it might actually make good sense to reduce our mental, physical and emotional dependency on cars, so we can enjoy life more. Okay…maybe don’t ditch your car completely but park it more and see what happens. That’s a money-saving experiment right now.